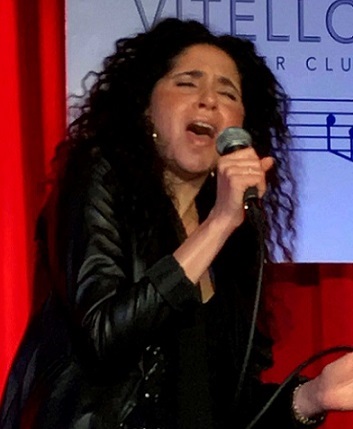 Katrina Woolverton Sings For Friends And Family At Vitello's In Studio City. The Former Defense Attorney Displays A Vocal Range And A Medley Of Songs On Par With The Best Of Singers. 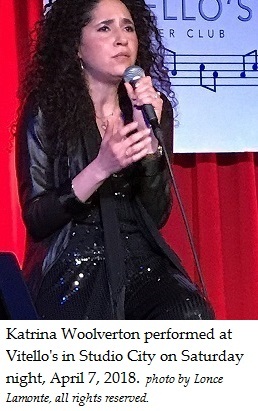 Katrina Woolverton, in her black, sequined, scoop necked top with pants and black leather jacket, looked out from the stage at her audience. She expressed she knew everyone in the room, and this was definitely her “friends and family” night. “You could all be over at my house,” she effused. The front windows at Vitello’s in Studio City twinkled with lights next to a picture of Katrina set-up as a marquee. The upstairs was her performance room with dinner tables for parties of sixteen and eight and four just like in the finest dinner show houses in Las Vegas. 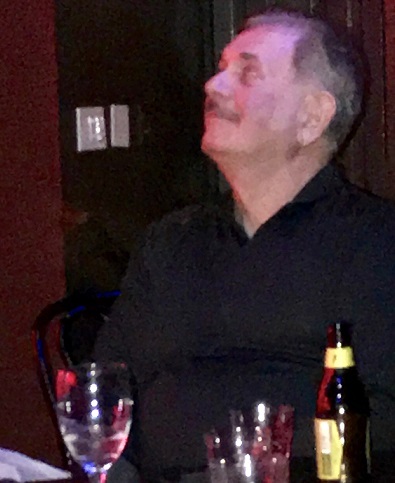 George Woolverton, Katrina’s husband, co-president of the California-wide law firm Stockwell Harris Woolverton and Helphrey, had mingled throughout the audience from table to table looking like a comfortable host before the show. Katrina’s mother, Mania, wore black also like her daughter but with tiny white polka dots on her long sleeved top. On one wrist she wore a stunning double stranded bracelet of large pearls. This week she will be leaving with Katrina on a tour starting in New England and ending up in Tennessee. Katrina early in her performance sang a Lou Rawls song. Her vocal range is vast while her versatility of genre moves from pop to rhythm and blues to country-western and to love songs. She’s a superlative torch singer. She can belt out a tune of heartbreak like the very best of vocal artists. Katrina sang Crazy which is best known for its rendition by Patsy Cline, the country-western singer who cut a tragic figure for her personal heart aches which culminated in her death in a plane crash in 1963. Katrina reminded her audience that Crazy was written by Willie Nelson. Katrina sang this melancholy melody with an unwavering, strong voice that never faltered. Her emotion poured forth as fine and as touching as the best of tragedienne singers like Patsy Cline and Edith Piaf. Then she sang another song about broken down love, one written by Baby Face. Katrina thoughtfully remembered Leon Russell, who died just before she was about to start a tour with him in late 2016. They were scheduled to perform at the Regent Theater on Main Street in downtown Los Angeles in November of 2016, but then Leon died and that tour was sadly cancelled. The lyrics from one of Leon’s best known songs is most recognizable. “I’m going to sing this song as a thank you to him,” Katrina told the room. 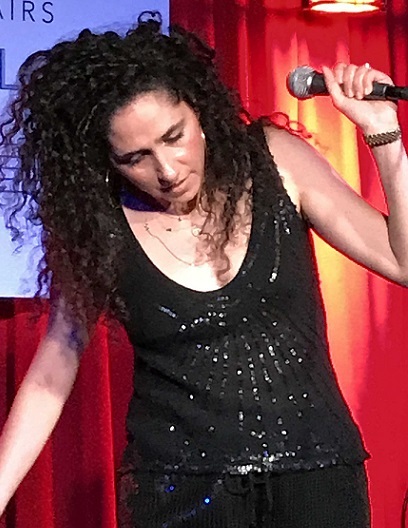 Katrina’s voice is in such top shape, that there’s never a scratch, scrape or a miss like regularly happens in live performances with even the most famous voice recording artists. She’s comfortable and at ease. 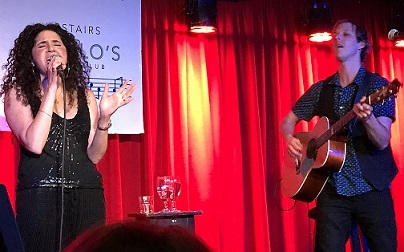 She has fun on stage with her acoustical guitar player, whom she calls “Johnny John”. 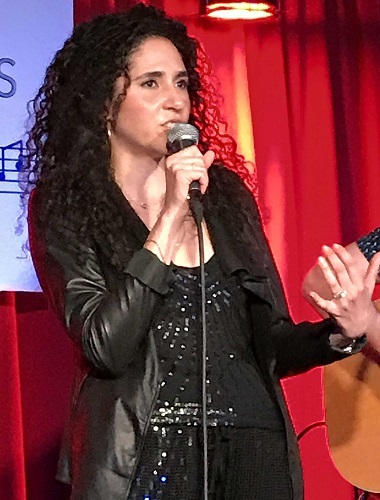 Mixed into her medley of torch songs, she switched the feeling to honor George Woolverton, her husband, who is a workers’ compensation defense attorney as she was once herself. She met George at a judge’s retirement party. Then, after becoming an experienced attorney, she jumped back into the career she’d left as a young person. She had won “Star Search” hosted by Ed McMahon as a girl, and then her life took a turn. Then it took a turn back and has gone forward with her dedicated career as a singer and song writer. 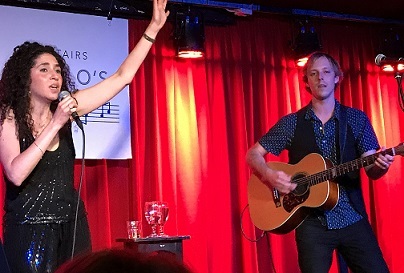 She told her audience that as a song writer, she has her songs that she wrote before she met George and the ones written after she met George. Randi Tobin, with reddish blonde, below-her-shoulders straight hair, the wife of Mark Tobin, a Los Angeles area workers’ compensation attorney, was seated at a front stage table. She reminded this writer that we were in the very restaurant where actor Robert Blake had brought his grifter, con-artist wife to dine just before she got shot and killed sitting in their car just a couple of blocks away. So, this fine restaurant has fame and even notoriety! It was the year 2001 when popular opinion said that Blake wanted to get rid of his undesirable wife, Bonnie Bakley. He’d left his gun on the seat of a booth at Vitello’s and returned to fetch it while he’d left his sitting duck wife waiting in the car. Blake was acquitted of the crime in 2005. I checked out the booths downstairs after visiting the restroom on that floor. “Thank you all for coming tonight,” Katrina expressed as she closed her show. 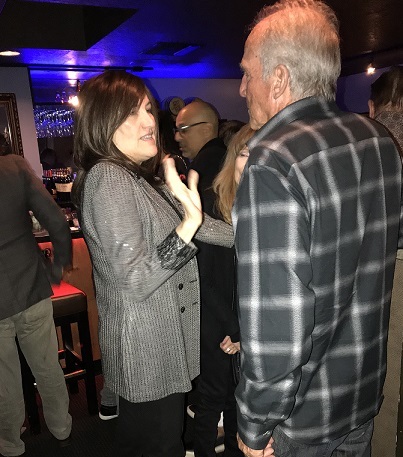 Katrina had an intimate after performance party in the small bar next to the dining show room. Carroll Wheatley was there, from the law firm of Laughlin Falbo Levy & Moresi, talking to George Woolverton. Katrina sat on a high stool with a crowd around her. A generous guest bought this writer a glass of white wine. The company was wonderful. Then the night finally had to end.